Park Hill townhomes feature spacious and wide thoughtfully designed interiors. This community features 26 homes across 4 distinct floorplans, located in a peaceful residential neighbourhood giving you room to breathe. There's a home for everyone at Park Hill. 1518 sq.ft. to 1804 sq.ft. 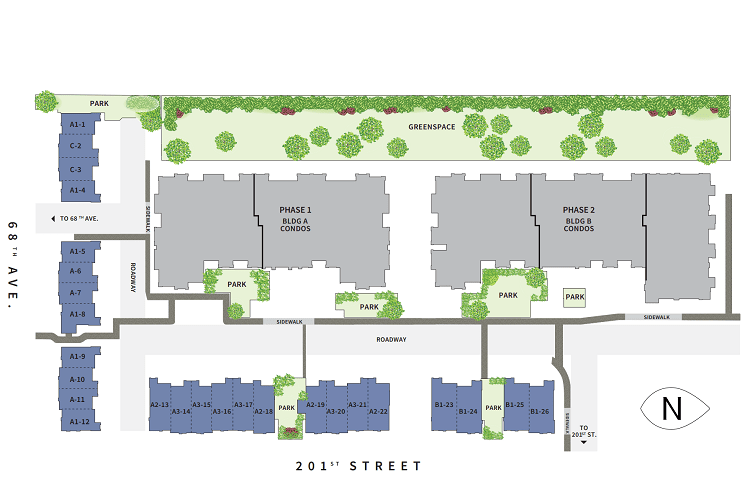 Phase I is moving quickly, but select units are still available. Contact us today to reserve your home. This 3 bed, 3 bath home features luxury vinyl plank flooring with superior sound dampening and timelessly water resistant plush carpet in all the bedrooms. This 3 bed, 3 bath home features distinct modern architecture designed locally by Keystone Architecture. This 2 bed + flex, 3 bath home features Frameless 5ft glass shower in ensuite with oversized porcelain tile to the ceilings. This 3 bed, 3 bath home features quartz counters and subway tiled backsplash and modern flat panel soft close cabinets with brushed nickel sleek hardware. This 3 bed, 3 bath unit features a terraced front yard with lush landscaping and street access entry providing convenient & spacious access.